DDR2 vs DDR3 RAM - What's the difference between DDR2 and DDR3 memory? How do you tell them apart? Can you use DDR3 RAM in a DDR2 socket? Get the full answers right here. The RAM found in most modern desktop and laptop computers is DDR3 RAM (DDR3 is short for Double Data Rate Type 3). To be more precise, its full technical name is DDR3 SDRAM. If your computer was built in 2008 or earlier, then chances are that it has the older DDR2 RAM instead. 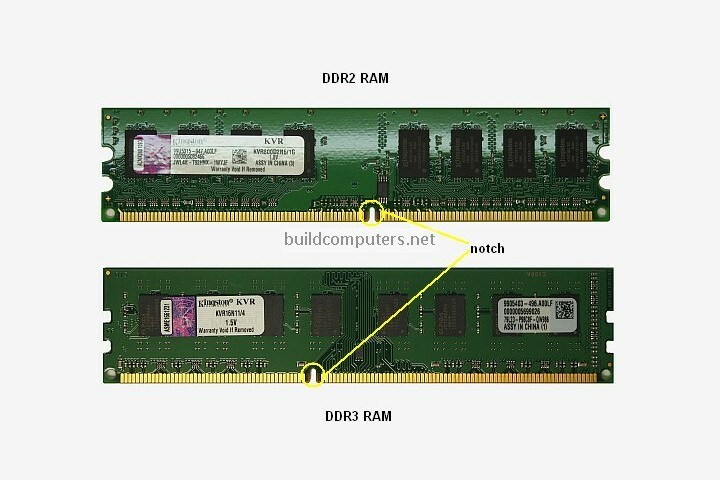 At buildcomputers.net, we don't take chances or make guesses... so let's learn what are the differences between DDR3 vs DDR2 RAM and how to tell them apart. Here's the trick to tell them apart: Look at their notch positions (circled in yellow above). This difference in notch position is also why you can't use DDR3 RAM in a DDR2 system or install DDR2 RAM into a DDR3 slot (even though they have the same number of pins). In short, DDR2 and DDR3 RAM are not compatible with each other: If your motherboard has DDR2 RAM slots, then you can only use DDR2 RAM. The same applies to DDR3 RAM. What's the Difference between DDR2 and DDR3 RAM? From the DDR2 vs DDR3 table above, we can see that DDR3 RAM offers better performance while consuming less power. The difference in clock speed and max transfer rate numbers look impressive on paper, but DDR3 RAM is in fact just 2 to 10% faster than DDR2 RAM for most real-world applications (depending on your hardware specification and usage). DDR3 RAM consumes less power and produces less heat than DDR2 RAM at the same clock speed (e.g. DDR3 vs DDR2 RAM that is both running at 1,066 MHz). However there is a catch: RAM with higher clock speeds have higher power consumption so DDR3 RAM running at 2,133 MHz will still drain more power than DDR2 RAM at 1,066 MHz.